This article on Renfrewshire 24 is entitled New Option Could See Glasgow Airport Rail Link Run From Relocated Glasgow St. James Station. The new option, which is proposed by Junction 29 (Scotland) Ltd, would relocate Paisley St. James Street station nearer to the airport and it would be connected to the airport using a PRT system similar to that used at Terminal 5 at Heathrow. This Google Map shows the area. Junction 29 of the M8 is the mass of spaghetti in the upper middle of the map, with the Inverclyde Line passing to the South-west of the junction. Paisley St. James station is towards the bottom of the map. 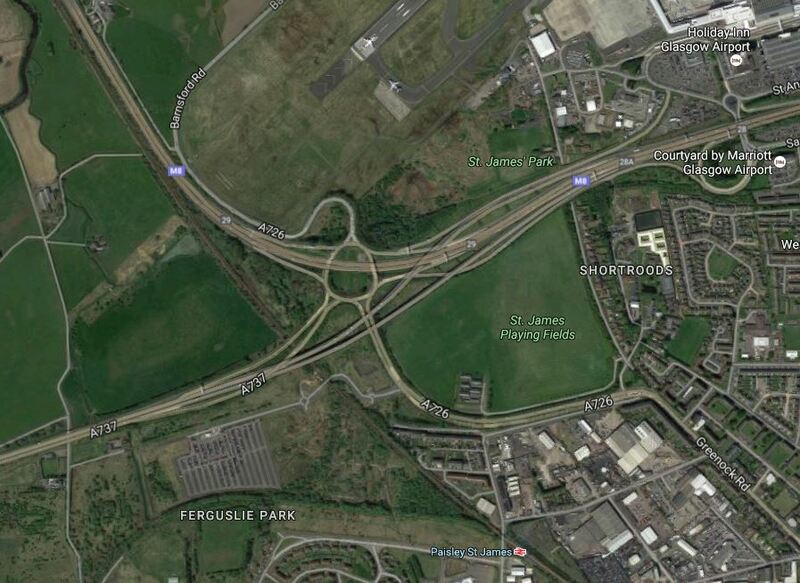 Junction 29 (Scotland) Ltd. own the block of land to the West of the railway and the new station would be built in this area, where the PRT system would connect to the Airport. I think it could be a feasible plan and these are my thoughts. Wikipedia says this about the PRT System at Heathrow. Construction of the guideway was completed in October 2008. The line is largely elevated, but includes a ground level section where the route passes under the approach to the airport’s northern runway. Following various trials, including some using airport staff as test passengers, the line opened to the public in May 2011 as a passenger trial. Subsequently it was made fully operational and the bus service between the business car park and Terminal 5 was discontinued. The pods use 50% less energy than a bus. They run 22 hours a day. Unlike all UK road and rail traffic, which drives on the left, the PRT system drives on the right. As of May 2013 the system passed the 600,000th passenger milestone. The interesting thing, is that it runs under the runway approach, so it must have a fairly small footprint. I actually think that using this system has other advantages. It could go on a roundabout route between the station and the Airport, serving car parks and other important places. It could serve the car parks, which are also proposed for the site. It could bring those with movement difficulties to the station for the Park-and-Ride to Paisley and Glasgow. It is very much a proven system. The tram-train alternative works in many places in the world, but the concept seems to cause Network Rail indegestion. The PRT System is independent of the railway. But in my view the system’s biggest advantage is that it could have a serious wow factor for children of all ages. The cost of the PRT option is quoted at £70-£80m, as opposed to £144m for the tram-train alternative. Journey times to the airport will certainly be competitive, but I think the wow factor will encourage passengers to use it, whether they come by train or car to the station. Why Would You Want To Close The Existing Station? I would not close the existing Paisley St. James station for these reasons. It serves Paisley Town centre and St. Mirren Football Club. Closing it could be a hassle. Extra stations are never a bad thing. Modern trains stop and start again at a station very quickly. The new station could be called Glasgow Airport to avoid confusion. But then there may be better reasons to close it. There needs to be at least four trains per hour (tph) to Paisley Gilmour Street and Glasgow. If not more, as the frequency of the PRT system will annoy passengers waiting for the trains. I also think that a turnback facility should be provided, so that a posh Airport shuttle train could work a 2 tph limited-stop service to Glasgow Central. If Glasgow got its act together, the posh train could also serve Edinburgh. It is stated in the Renfrewshire 24 article, that the new station and the PRT system could be built in twelve months alongside the existing network. As all the land is owned by the Airport, Junction 29 and Network Rail, this must help, unless they find newts. They could even lift a lot of the design of some of the other new stations like Kirkstall Forge. I’m sure Junction 29 (Scotland) Ltd. have got some good plans for the rest of their site. Go for it! Glasgow has been procrastinating for far too long! I think we’ll see a lot of systems like this around the world! The system is described here in Wikipedia. It’s British by the way and was developed in Cardiff and Bristol.